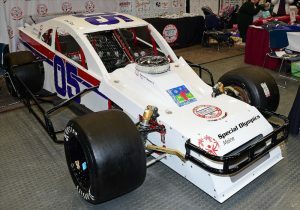 Driver Jacob Dore and owner Steve Perry will team up to race on behalf of the Hometown Foundation and Maine Special Olympics in 2019. As part of the Dream Ride Experience program, Dore, the two-time Star Speedway Modified track champion, will make his return to the class for the first time since 2013 in the Bullring Bash Quarter Mile Challenge season opener at White Mountain Motorsports Park on June 16. The Dream Ride racing effort combines the efforts of JRD Racing and Mainely Motorsports to benefit the Hometown Foundation and its support of the Maine Special Olympics. The venture is privately funded, allowing all sponsorship money and race winnings to be donated directly to the Hometown Foundation to provide to the Maine Special Olympics. Among other accolades, Dore is a multiple race winner in the Granite State Pro Stock Series, including a victory at White Mountain in 2016. Perry is a longtime car owner and promoter of short track racing whose Mainely Motorsports TV show and Northeast Motorsports Expo are pillars of the New England Racing community. With that in mind, both are excited to hit the track in June, both for the White Mountain facility and the opportunity to be part of the inaugural Bullring Bash event. For more information on Mainely Motorsports, visit http://www.mainelymotorsportstv.com. To follow JRD Racing on Facebook, click here. To keep up with the Bullring Bash Quarter Mile Challenge, teams and fans can visit http://www.bullringbash.com.